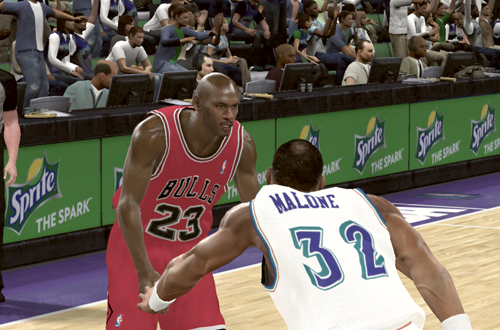 Game 6 of the 1998 NBA Finals came down to one final shot by Michael Jordan, so it seems only appropriate that my attempts to go back and finish the Jordan Challenge in NBA 2K11 come down to that same game. 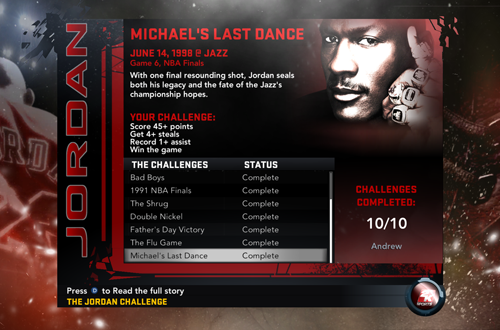 The last challenge standing between me and finally finishing the mode (and unlocking MJ: Creating a Legend) all these years later is Michael’s Last Dance, which involves re-creating the performance that clinched MJ’s sixth NBA title. Now, the outcome of my game probably isn’t going to come down to one final shot, but out of all the games in the Jordan Challenge, this is the one that I expect I’ll need to attempt at least a few times before I complete it. I’ve tried it a few times in the past, and have always come up short on one statistical mark. However, it’s time to give it another try, in order to finally finish the Jordan Challenge. Join me as I re-live Michael’s Last Dance with the Chicago Bulls…most likely more than once. With this game in the Jordan Challenge, it’s a case of “Here’s one I prepared earlier”. In a previous attempt, I’d scored the requisite 45 points (not too difficult, especially with no field goal percentage requirement), and picked up the one assist (very easily done). I’d also taken control of the game in the second half, and saved it with only one goal left to achieve: pick up four steals. I’ve tried replaying the challenge a couple of times before, only to end up a couple of steals short. I considered starting this one over so that I have a bit more time to try for the steals – and fewer fouls to hinder me – but ultimately decided that I’d try again from my previous save first. I also decide that I’ll look into some tips for getting some easy steals in NBA 2K11. It’s not that I’m incapable of coming up with steals in the game, but I’m all for increasing my chances of succeeding on the first try…well, the first try of this latest round of attempts, anyway. As it turns out, IGN has a pretty solid guide to fulfilling the statistical requirements for all the games in the Jordan Challenge. Quite a few of the tips are strategies I’m already familiar with, and I was admittedly hoping to discover a couple of exploits, but it’s at least confirmed that some of the ideas I already had in mind should work. Loading the saved game, I’m reminded that Michael Jordan has three fouls about halfway through the third, and zero steals. As I mentioned before, I’d already fulfilled the 45+ points and 1+ assists goals, and the Bulls are leading the Utah Jazz 55-35. This means that I can completely focus on getting the four steals, and as long as I don’t get too sloppy, I shouldn’t have to worry about letting the game slip away, either. The three fouls definitely make me hesitant to try for the strip, so I set about playing the passing lanes, which MJ was certainly a master at doing in real life. To be blunt, the attempt goes miserably. The game is never in doubt, thanks in no small part to Jordan finishing with 60 points. I just can’t seem to pick off any passes though, and a couple of frustrated attempts to knock the ball loose only result in MJ’s fourth and fifth fouls. The CPU manages to get MJ’s only steal of the night, and although I win the game, it’s a hollow victory without the four steals to complete the challenge. I resolve to try again, this time double teaming John Stockton as suggested. I also consider the possibility that I may need to start over, so that I have more time to get the four steals (and fewer fouls). Putting up the 45 points shouldn’t be a problem. And so begins a series of increasingly frustrating attempts. On one attempt, I ended up getting MJ his third steal with about three minutes left, at which point I saved the game again. After a couple of failed attempts, I managed to get an interception with less than 15 seconds left, tallying what I thought was MJ’s fourth steal. I was puzzled to find his stats only listed three steals, and it was only after reloading that I realised having not saved in a dead ball situation, the third steal had been erased. Getting two steals in less than three minutes was proving to be far too frustrating a task, so I gave up on that save in favour of starting all over again. Between seeing MJ’s hand clip through the ball over and over again, and picking up several cheap reach-in calls thanks to NBA 2K’s notorious “press steal to foul” canned animation, I was really getting sick of the game. I decided that if it wasn’t going to play fair, neither was I. I messed around with the sliders, turning down the CPU’s ball handling ability and the user reach-in foul frequency, and maxing out the user stealing ability. As it turns out, the sliders have no effect on the Jordan Challenge – obviously to prevent such cheating – so I was just going to have to do it legit. Determined to finish this challenge once and for all, I came out of the gate firing with MJ, and doing all that I could to get the four steals as quickly as possible. 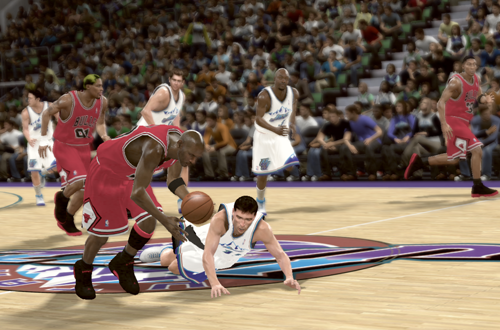 I double-teamed Stockton, and hounded him with MJ. I roamed the passing lanes, and tried to sneak up on players with the ball to knock it loose from behind. Quite a few times I managed to get a hand on the ball, but the player either recovered it, or another Bull ended up with the steal. Still, MJ finished the first half with 39 points, six assists, four rebounds, two steals, and three fouls. It was a much better restart point than the one I had saved, so I overwrote it. Fortunately, no steals disappeared this time. 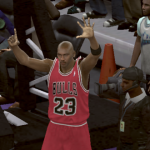 After missing out on a few more steals that the ballhandler recovered, or another Bull scooped up, I managed to swipe the ball from Stockton a couple of times to finally get the four steals. I’d been pouring in the points with MJ and doing a pretty good job on the Jazz defensively, so the game was well in hand entering the fourth. I decided that I was going to punish Utah for all the trouble the challenge had caused me, and kept attacking relentlessly with MJ. He finished with 64 points on 26-for-35 shooting, 11 assists, six rebounds, four steals, and a block on a layup attempt by Karl Malone. 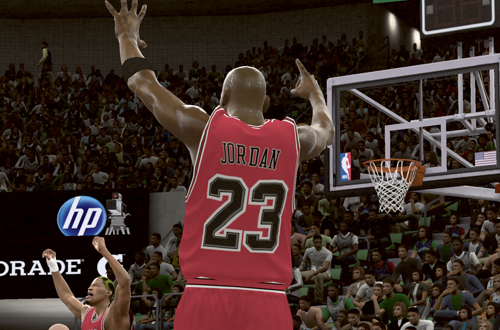 When the final buzzer sounded, I’d finally completed the Jordan Challenge! Despite the fact there were some really frustrating moments, I did genuinely enjoy going back and completing the Jordan Challenge. No matter what the genre, I always feel a sense of accomplishment when I can pick up a game I never finished and finally complete it, so it’s something I like doing in between playing the most recent games in my collection. I’d also have to say that it’s given me more of an appreciation for NBA 2K11. Now that I’ve had more experience with the series and am far more familiar with its controls and idiosyncrasies, I’ve been able to enjoy it a lot more than I did back in 2010-2011. I’m also glad I unlocked MJ: Creating a Legend legitimately. As far as my favourite challenges are concerned, I think I might have to give the nod to The Flu Game, and Father’s Day Victory. Neither was as difficult as I thought they might be with their rebounding goals, and the former is one of my all-time favourite Michael Jordan performances as well. The 1991 NBA Finals challenge was also immensely satisfying given the comebacks I was able to make after falling behind early on in a couple of the games. All of the challenges had their fun moments, and brought back fond memories of growing up watching Michael Jordan. I guess it was only fitting that the last one I finished was Michael’s Last Dance, too. While I’m done playing NBA 2K11 and the Jordan Challenge for now, I think I’d revisit it again sometime in the future. I did pick up the game on Xbox 360 last year, so it might be fun trying to complete all the challenges again in that version. In doing so, I’d like to try finishing them without saving mid-game at any point. While Michael’s Last Dance was the only challenge I had to retry from a saved game, I’d like to see if I can complete the challenges without a safety net. In any event, it feels good to take care of some more unfinished business, and to know that NBA 2K11 is another game I can eagerly return to when I feel like some retro basketball gaming.